When I was in jail for civil disobedience and surrounded by all the great libertarian books that friends and family had sent me, I realized that we needed one ultimate conversion tool. So I combined all of their best features into one, easy-to-read, 100-page proclamation of FREEDOM! Thanks to the hundreds of people who helped in the editing process, we succeeded in creating the most effective method to fully wake people up in a way that they never want to go back to sleep. The book is now in its fourth printing and has been downloaded over three million times. 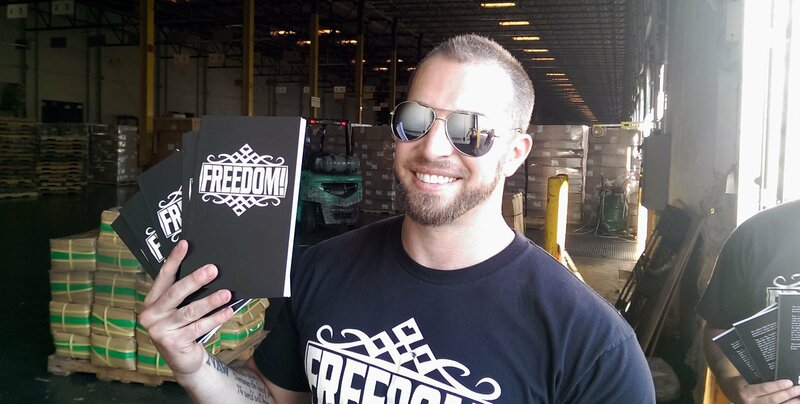 Thanks to the many people who have read and promoted it, we’ve been able to do three national tours, giving away FREEDOM! for free. You can get it free in every digital format, including audiobook at TheFreedomLine.com. Because it’s just 100 pages, quantities over 100,000 can be printed for about $0.30 each, and delivered for about $0.30 each. That’s a mere $0.60 to deliver a copy of FREEDOM! So we raised $131k to put a copy in every residential mailbox in New Orleans (about 204,000) all at the same time. (You can see the budget and invoices from the printer, logistics company, and the bulk mailer below. The final cost per book with all the other core expenses came out to just sixty four cents!) The books will be arriving between January 4th and 11th. Thanks to all of you who made it possible to get to this point, and especially to our sponsors for this project, including Bitcoin.com, Dash, and SmartCash. The version being delivered to the residents of New Orleans is a special edition printing. We’ve added a letter in the front cover from me explaining our presidential campaign’s plan to peacefully dissolve the federal government, the World’s Smallest Political Quiz, a plug for the Louisiana Libertarian Party, acknowledgements of the many people and organizations that helped make this project happen, and of course postage on the back cover. This book bomb is just the first of many. We plan to replicate this all over the country (the world if necessary!) until the desired effect is achieved. In order to be able to repeat this, we need to make sure it’s as successful as possible. We want to make sure that when the books gets in peoples’ hands, they know that everyone else in the city got the same book at the same time. We’ll be printing thousands of signs, hiring a polling company, contacting media outlets, and organizing a boots-on-the-ground effort to maximize awareness of the event. While we have already spent about $131k on the printing and mailing and have most of what we need for on the ground efforts, your donations would help take this to the next level right now. More signs, more ads, more free bumper stickers, more travel expenses for volunteers who want to help. More people who read the book. More converts. More freedom. Yeah. You get the idea. You can donate by PayPal or crypto at thefreedom.fund. We also need volunteers to help with signs and flyering. If you can be there at all to help at any time from January 1st to the 13th, please reply to this email or hit up our volunteer coordinator, Elijah Gizzarelli. elijah@thefreedomline.com. To see a long, early version of this idea with my background thinking and the development of the concept, click here.